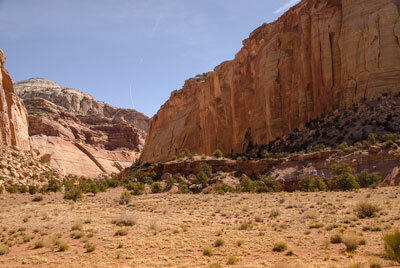 Located in south central Utah, Capitol Reef is probably the least known national park in the state. Often overlooked by visitors who flock to the Beehive State to see Bryce and Zion — two of the state’s gems — Capitol Reef National Park (435-425-3791, www.nps.gov/care) is a hidden treasure filled with massive cliffs, sandstone domes, and canyon walls dotted with Native American petroglyphs. 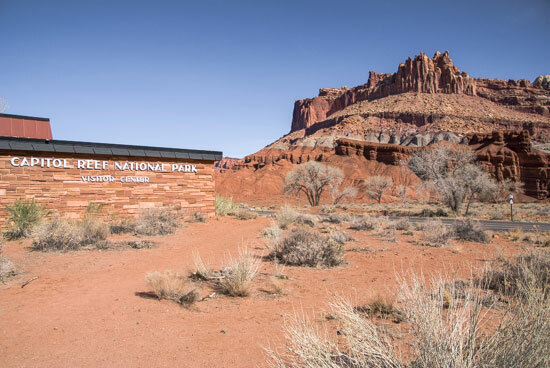 Although not a reef is the strictest sense, the park was named for the white domes of Navajo sandstone that resembled the Capitol building, and for the 100-mile long Waterpocket Fold that proved a formidable barrier to early explorers. Since many of these explorers had a nautical background they likened the Waterpocket Fold to a reef — a barrier that was often encountered at sea. Today, parts of the park are still pretty rugged, but it is possible to enjoy its majestic beauty from strategic vantage points, both inside and outside of the official park boundaries. Located off Highway 12 in Boulder, not only is the Burr Trail one of the most scenic drives in America, but it also offers some distant views of Capitol Reef’s Waterpocket Fold. Situated midway between Bryce Canyon and Capitol Reef, this former cattle trail, was originally blazed by John Atlantic Burr. Today the first portion is paved and passable in dry weather, and it offers a scenic drive trough Long Canyon, with spectacular views of the Circle Cliffs and the Waterpocket Fold. The Burr Trail Grill (435-335-7565, www.burrtrailgrill.com), which is located on Highway 12, marks the turnoff for the scenic drive. It makes a nice lunch stop, with level access to the front door from the dirt parking lot. The menu features a selection of burgers, salads and sandwiches, but they are especially known for their pies. There is also a level pathway over to the Trading Post next door, which offers souvenirs, jewelry and works by local artists. Although there are no accessible restrooms in the complex, access at this site is continually improving, so I have high hopes for the future. The adjacent Burr Trail winds through Grand Staircase-Escalante National Monument along a paved road, before it turns into a dirt road near Capitol Reef. There is a wheelchair-accessible picnic shelter near the end of the paved road, with a scenic overlook. You’ll probably have it all to yourself, as you look over into Capitol Reef National Park and see the Waterpocket Fold. At that point you’ll probably understand why it presented such a barrier to early explorers. Today switchbacks run through it, and if you have a four wheel drive vehicle, you can continue on to Capitol Reef National Park. If not, you’ll have to retrace your steps and take Highway 12 north to Highway 24, and head east to the main park entrance. Although this is the most touristed area of the park, it’s definitely worth a visit. The Visitor Center, which is just a short distance from the west entrance, features a great view of The Castle; an appropriately named formation that towers over the building. There is accessible parking and level access to the Visitor Center, which houses interpretive exhibits and a park information center. From there, follow the signs along the 20-mile roundtrip scenic drive, where you’ll see plenty of red rocks and canyons. 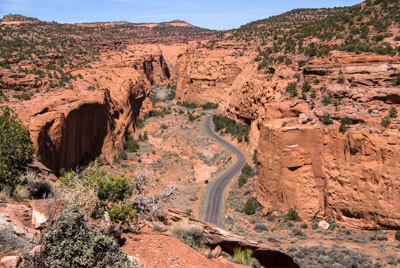 The route passes Grand Wash, Slickrock Divide and ends at Capitol Wash. There are plenty of pullouts along the way; and even if you can’t negotiate the gravel, you can still enjoy the great windshield views. 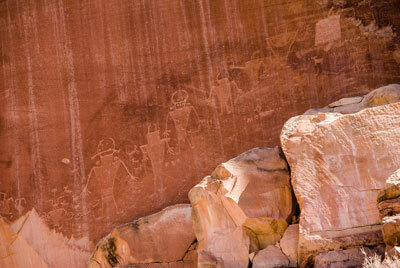 Once you are back up on Highway 24, be sure and stop to see the petroglyphs. There’s only a wide spot in the road that serves as a parking area, but it is paved, and there is level access to the nearby boardwalk. From the viewing platform near the parking area you can get a good look at the petroglyphs on the adjacent canyon walls, through the wheelchair-height viewing scopes. There’s also a shaded boardwalk trail along the canyon, which makes for a very accessible quarter-mile roll or stroll. If you’d like to overnight in the area, the Fruita Campground has five wheelchair accessible sites. 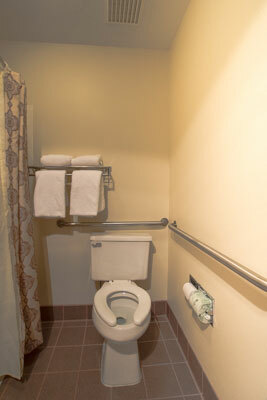 They are located close to the accessible restrooms, which feature flush toilets, but no showers. Although these sites are designated for wheelchair-users, reservations are not taken for them, so they may not be available during peak seasons. 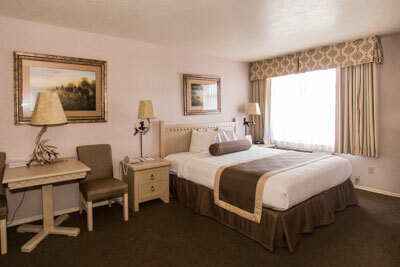 If you’d like a few more creature comforts, then the closest accessible lodging option is the Capitol Reef Resort (capitolreefresort.com), located just one mile from the Visitor Center. There is level access to lobby and the adjacent restaurant, from the accessible drop-off area near the front door. From there you can drive down to accessible Room 401, which has accessible parking directly in front of it. Access features include wide doorways, good pathway access and a lowered closet rod. The room is furnished with a 24-inch high king-sized bed with wheelchair access on the left side (as you face it), and 21-inches of clearance on the right side. It also includes a refrigerator, a microwave, a table and two chairs. There is a wide pocket door into the spacious bathroom, which boasts a full five-foot turning radius. 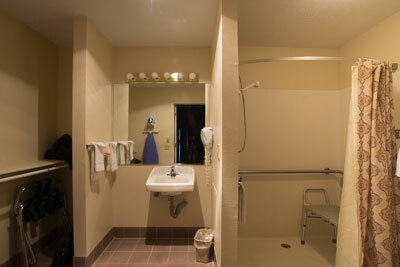 It includes a roll-in shower with grab bars, a hand-held showerhead and a portable shower chair. The toilet grab bars are located on the left and back walls (as seated), and the bathroom also includes a roll-under sink. They even remembered the little things, like a lowered mirror and robe hook. It’s a very quiet, comfortable and accessible place to stay, and you just can’t beat the location for exploring Capitol Reef National Park.